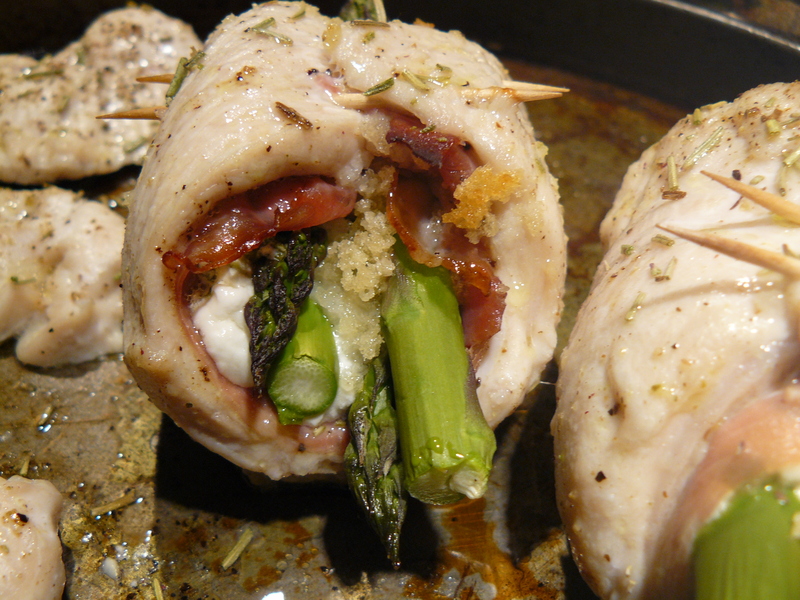 How about something for dinner that tastes oh so gourmet, yet requires minimal prep and effort? It’s a new recipe that’s so easy, it’s almost not a recipe–the best kind in my book. I made this dish for two; you can easily multiply to make for more people. I bought a 1-pound boneless, skinless chicken breast, split it into two cutlets, then baked the rest of the chicken to make chicken salad tomorrow. 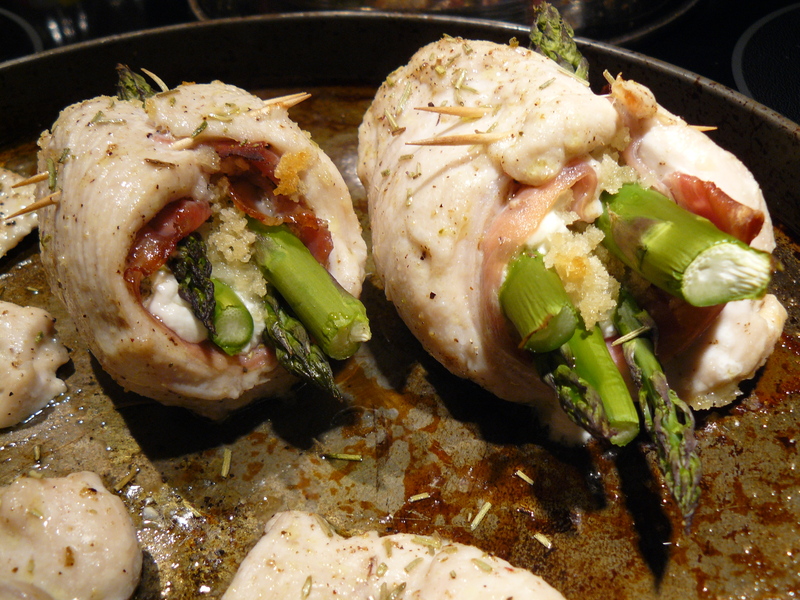 Three cheers for efficiency, rolled up with the greatness of local goat cheese, native asparagus and one of my favorite hams! Coat with olive oil, season with salt and pepper on both sides. Layer a slice of your favorite ham over cutlet. Break off woody ends at bottom of each asparagus spear. 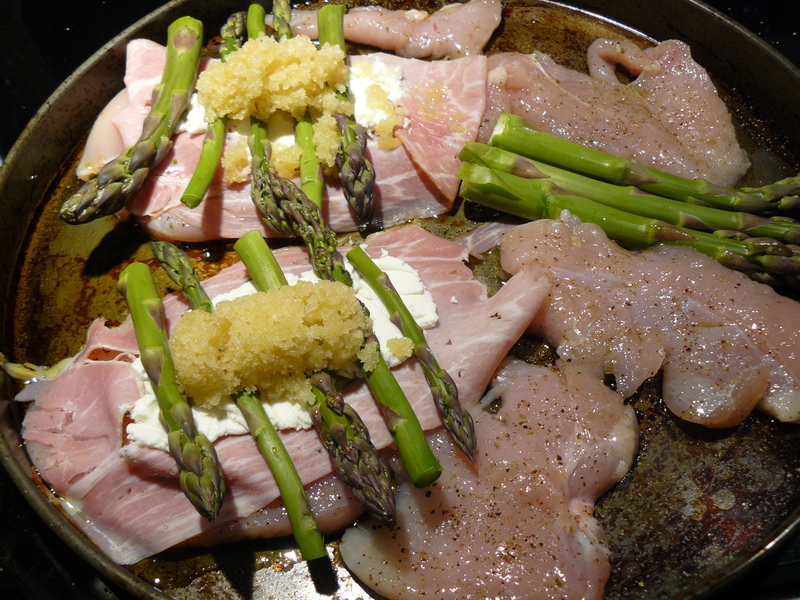 Place 4-5 asparagus spears over the chevre. Top with 1 tablespoon breadcrumb mixture. Melt about 1.5 teaspoons salted butter, stir with 2 tablespoons panko breadcrumbs and a drizzle of white truffle oil. Roll up and skewer with toothpicks. 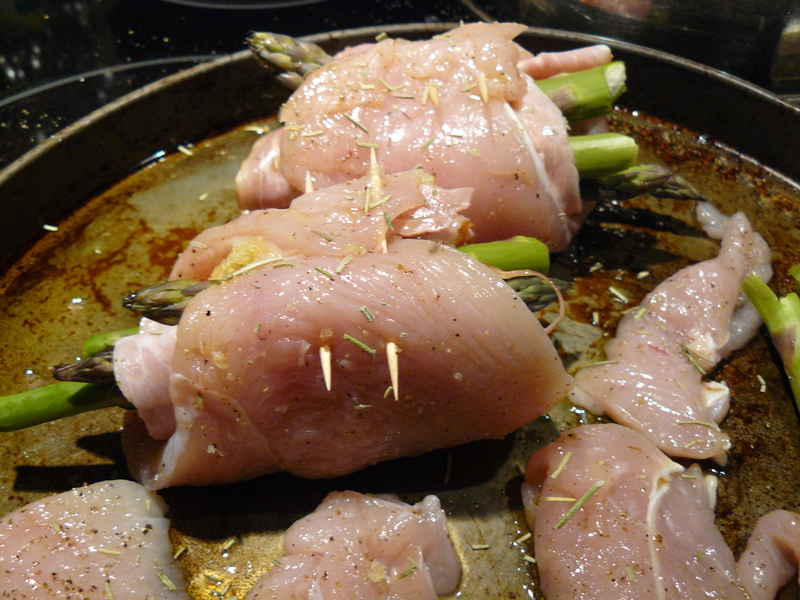 Sprinkle with dried rosemary. Dinner is served! Isn’t it almost like magic when something so delicious can be so simple and impressive–and quick? And makes lunch for the next day, too? Let’s try something new and Italian this week–something to add to an Italian combo grinder, sandwich or antipasto. I made a batch today and am eagerly awaiting a killer sandwich later this week! It’s very easy to make, just a matter of waiting between steps. Peel eggplant. 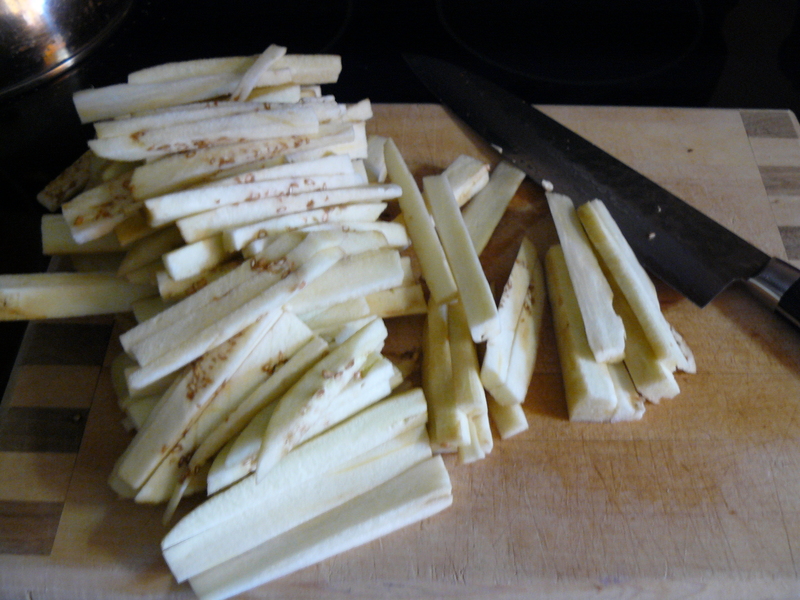 Slice into thin strips, then cut again so they’re like thin french fries. Set eggplant strips in a colander, sprinkle with Kosher salt. Toss with your hands to distribute the salt evenly. Set colander inside a large bowl, then place another bowl on top of the eggplant with a heavy can inside (I used a can of crushed tomatoes) to weigh it down. Set aside for four hours at room temperature. Give the eggplant strips a gentle squeeze by the handful before you boil them.Before we get too far ahead, sterilize (run through the dishwasher) two 8 oz. glass jars or containers.In a saucepan, bring water and vinegar to a boil. Add eggplant and continue to boil, stirring occasionally till eggplant is tender–2 to 3 minutes only. Drain in colander promptly, then set colander inside a bowl. 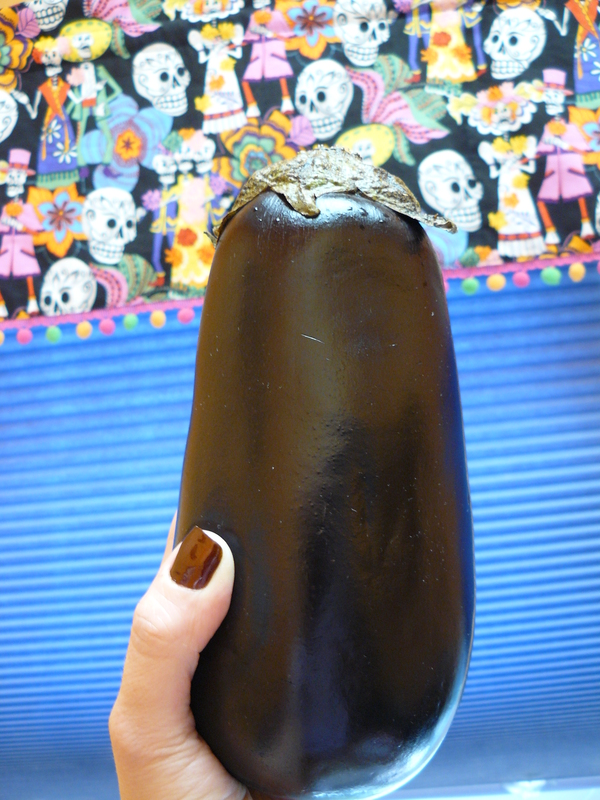 Once again, place another bowl on top of the eggplant with a heavy can inside to weigh it down. Continue to drain, covered for about 2-3 hours on the counter. Gently squeeze eggplant by the handful to remove excess liquid. Coat the bottom of each jar/container with olive oil, then layer in eggplant, hot pepper rings, garlic and parsley. 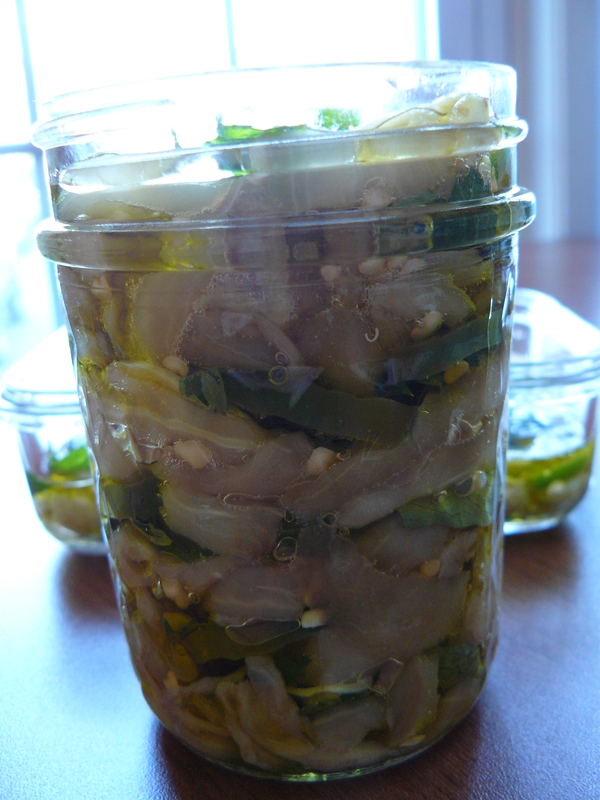 Repeat till the jar is almost full, leaving enough room to top with additional olive oil. Look at all the pretty colors! It could only possibly be prettier if you grabbed a red hot pepper instead of a green one. Sadly, all the red hots at the store were looking pathetic yesterday. 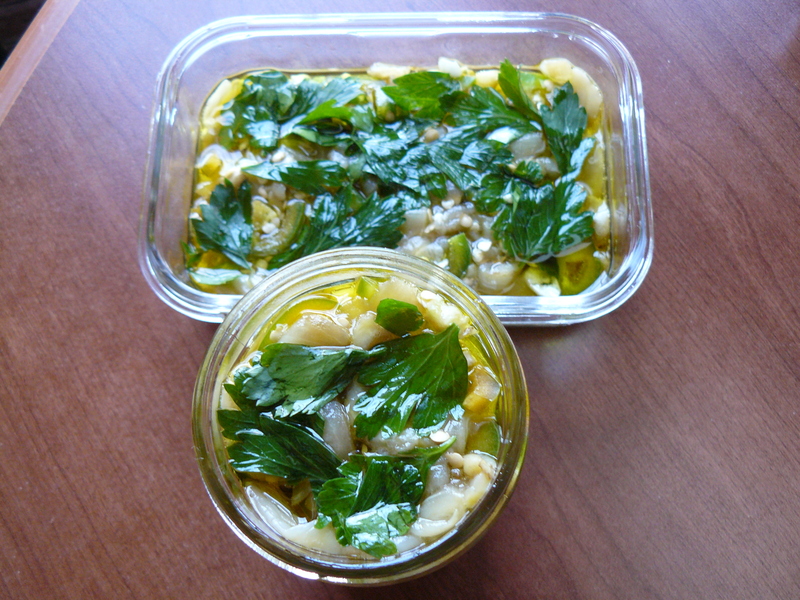 But you might be able to create your own Italian flag of marinated produce–2 cups’ worth! How many days before I dig in? Tick-tock, tick-tock! 😀 Not too many, I don’t think…but I’ll try to give it a couple of days for the flavors to meld together. So, till Tuesday, amici (if not before!)! 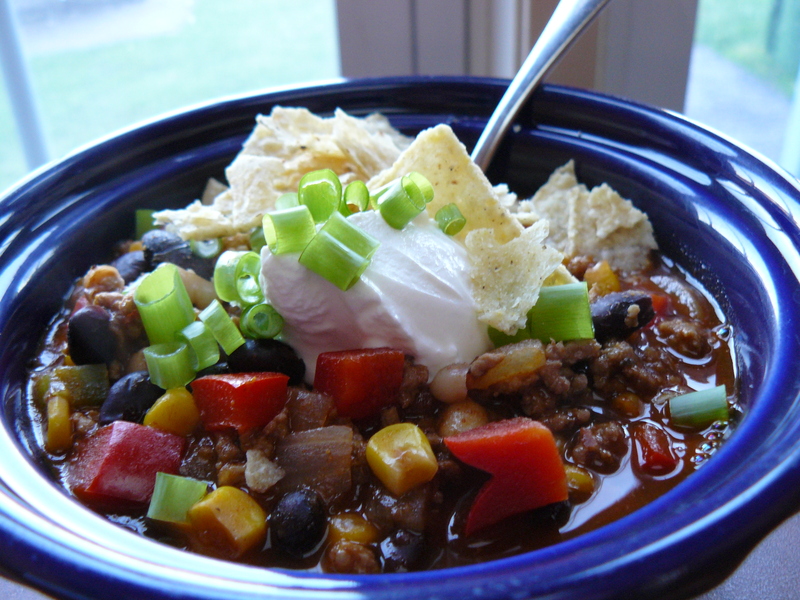 I missed Cinco de Mayo, but it’s as good time a time as any to share my recipe for taco soup. It’s what you get when you cross tacos with black bean soup. I really enjoy it and hope you will, too. Heat oil in a large saucepan over medium heat. Add onion and cook, stirring, until golden, about 5-6 minutes. Add ground pork or chicken, sprinkle with adobo, breaking the meat into small pieces as you cook it. Add beans, both peppers, fire-roasted tomatoes, tomato sauce, salsa, beer, water, spices and salt. 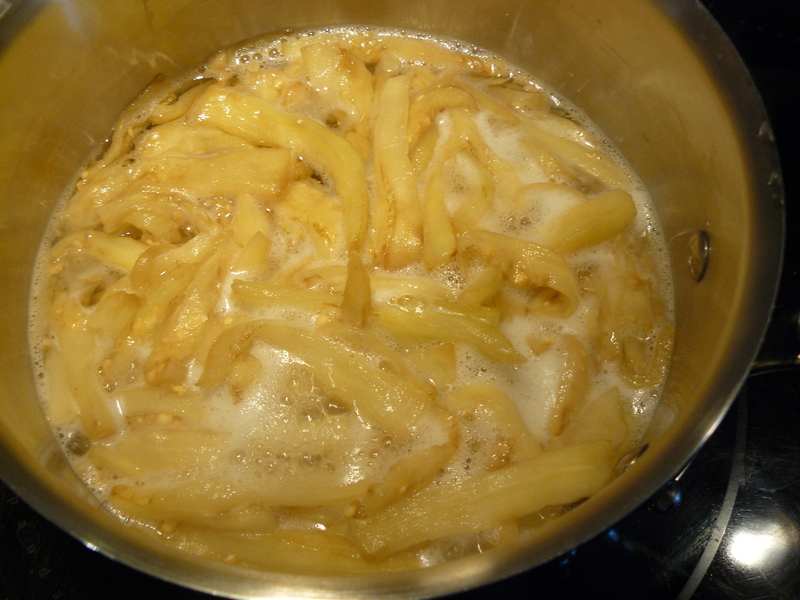 Bring to a boil; reduce heat and simmer for about 20 minutes. Add the corn at the end–just for maybe 5 minutes or so. Remove from heat and stir in lime juice if you like.